As Bob Woodward makes the rounds promoting his new book, The War Within, his interviewers keep asking the same question to which he keeps giving the same answer: What's the new program, technique, or technology that's supposedly responsible for the drop in Iraqi insurgent attacks? In the absence of knowledge, we're left to speculate--and speculate I will! First, we have to deal with the question of the numbers themselves. How substantial was the drop, and when did it happen? Global Security maintains three charts that help answer this question: (1) the overall level of violence; (2) the distribution of attacks, by province; and (3) the distribution of attacks, by target. Since a detailed look into the data's reliability is another big discussion altogether, we'll accept the numbers as presented as accurate, or at least in the right zip code of accuracy. The first statistic is important--but so are the other two. 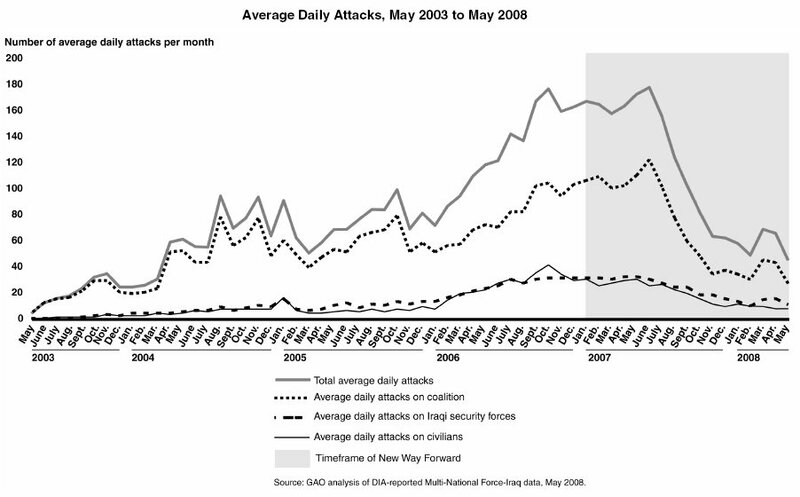 Since the middle of 2007, the frequency of attacks has dropped dramatically. Geographically, the major drops occurred in Baghdad and Anbar province. Target-wise, the big decrease is in the number of attacks on coalition forces. The number of attacks on Iraqis, both in uniform (security forces) and out (civilians) dropped far more gradually, and far less proportionately. Are there any conclusions we can draw? Since the numbers reflect insurgent attacks only, omitting violence from other sources, we're seeing only part of the story about fighting among Iraqi groups. Other indicators of internecine violence, such as the recent UCLA study of Badhdad by night, are necessary to depict what people mean by the phrase "civil war." On the other hand, we can say that either (1) Coalition forces have figured out some way to reduce the number of times insurgents try to shoot them and blow them up, or (2) something else is happening that has the side effect of reducing the attacks on US and British forces. Therefore, it's entirely credible that US officials have crafted some secret something that's responsible for the drop in attacks on Americans. The numbers do cast some doubt on the efficacy of the surge. 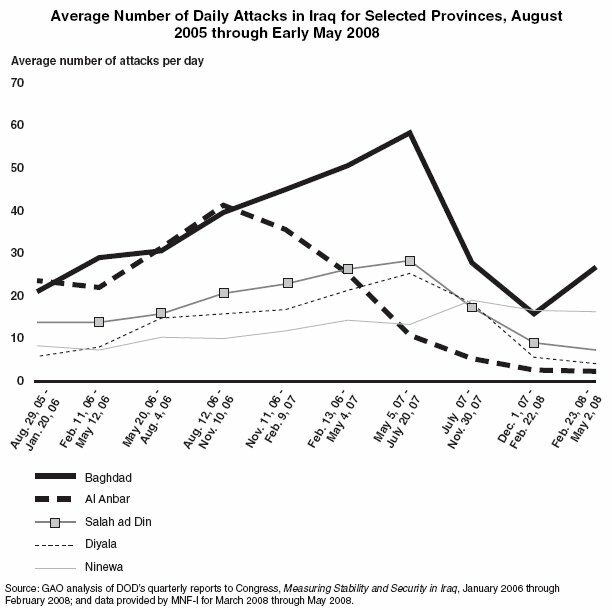 The focused escalation of effort in Baghdad and Anbar is responsible for some drop in violence. However, this escalation has not created as strong a protective shield around Iraqi civilians as many people assume. Insurgents can still harm, and therefore intimidate, Iraqis within the enclaves that US and Iraqi forces have struggled to create. Case in point is this weekend's suicide bombing of Shiite mosques in Baghdad. While no protective shield will be perfect, the aggregate statistics echo the anecdotal evidence, such as this weekend's attacks. Particular insurgent groups, such as Al Qaeda In Iraq, may be weakened, but some Iraqi insurgents retain the power to terrorize. Well reasoned, and worth continuing if for no other reason than the reasons WHY this lull in the fighting are happening have implications for HOW they can or can't be continued. 1. After about three years taking the insurgency seriously MNF-I has moved out of the FOBs and into the populace. This suggests that they've finally begun to develop some reliable intel sources. The has allowed it to pick off insurgents BEFORE they attack, i.e. MNF-I is playing offense rather than defense. The American public is blissfully (or willfully) ignorant that this probably includes some sort of loathesome Algeria or Phoenix-type assassination program, but I'm not sure it'd make a difference: they're only wogs, so, whatever. 2. Much of the present quiet may well reflect an Iraqi understanding that the foreigners' time in country is being talked up as limited. The factions have found that the level of violence - particularly tac air - they receive in return for a couple of dead GIs isn't worth it. And if the Yankees are going home in a year or two, why die today killing gringos when you can wait and die killing the people you'd rather kill (your old enemies the Shia/Sunni/Kurd/goatherders from the rival twn next door) in a fight that my bring you power and all the Middle Eastern goodies that go with power. 3. It also may reflect a lot of cans that have been kicked down the rad, like Kirkuk and the "regional confederations" stuff. I still think that there's gonna be a day of reckoning when an IA maneuver element is ordered into the north and the peshmerga is ordered to stop it. Or when the Sunni muj realize that the Shia government isn't going to take them as soldiers and instead is offering them jobs s garbagemen or nothing.